Blockchain fetches massive benefits to business with its boundless capacity and efficiency. It boosts the quality of enterprises by giving them a stable base by all means. Every Blockchain platform has a unique purpose to serve though all the platforms share a common root. When it comes to the financial infrastructure, it is stellar that performs better than the other platforms of Blockchain. Hire stellar blockchain developer now to build efficient stellar Blockchain networks. As a Stellar Blockchain Development Company, SHAMLA TECH works with top Blockchain professionals who excel in Stellar Blockchain Development. We provide Enterprise Blockchain development services for different spaces such as e-commerce, healthcare, supply chain, telecom, and logistics. Hire Stellar Blockchain Developer with us to get access to custom Blockchain solutions. 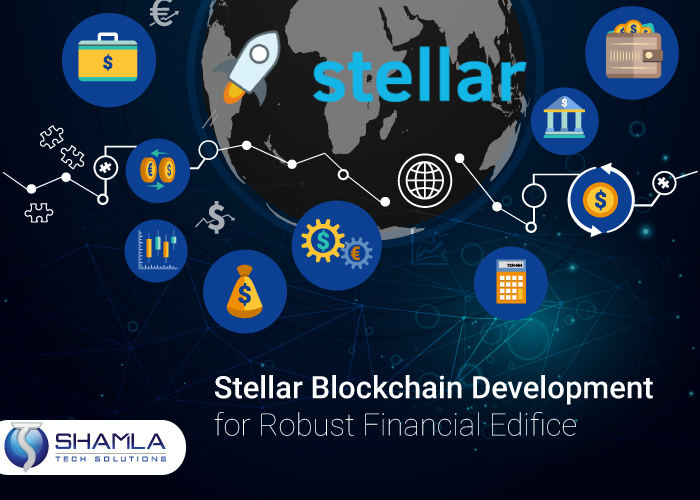 Stellar is an open source decentralized Blockchain platform that promotes cross border transaction of cryptocurrencies at a faster pace. The platform is powered by lumen (XLM), a native asset just like ether to Ethereum. Transactions on stellar are recorded on to a distributed ledger that can be viewed on any node across the globe. Where did stellar emerge from? The Stellar network was initiated in 2014 by Jed McCaleb, the co-founder of Ripple along with Joyce Kim. Ripple is one of the chief competitors of stellar. However, the latter has a work mechanism that is different from that of the former’s which is Practical Byzantine Fault Tolerance (PBFT), a kind of consensus. What is stellar’s consensus all about? Stellar relies on Federated Byzantine Agreement (FBA) for its functionality. To make faster and cheaper transactions possible, a majority of the participants (known as nodes) on the particular network has to approve every transaction. Every participant has to choose a mini network of other trustworthy participants who are positive about the agreement. Once the mini-networks (also known as quorum slices) overlap, the agreement becomes a success validating the corresponding transaction. The wisest decision one ever makes when it comes to a stellar Blockchain development is to hire the best stellar Blockchain developer. This is because a Blockchain expert can tailor a Blockchain project to perfection in every possible way. Analyze the Blockchain team thoroughly and get to know the field expertise of every Blockchain developer. Pick the one who understands your vision better and can give you rich Blockchain solutions characterized by matchless quality and high performance. High-quality enterprise Blockchain development is what SHAMLA TECH stands for. We are a team of passionate developers who couple dedication with smart work to come up with innovative Blockchain deliverables. Our clients are our priority and our Blockchain services are completely based on their commercial needs. Hire Stellar Blockchain Developer and programmer with us for a successful stellar Blockchain venture.